One day Lunar Saloon will be designing video games and SpaceX memorabilia from Elon Musk’s moon pitstop. For now, the creative studio started by husband and wife team Alex and Meg Griendling calls Minneapolis home. 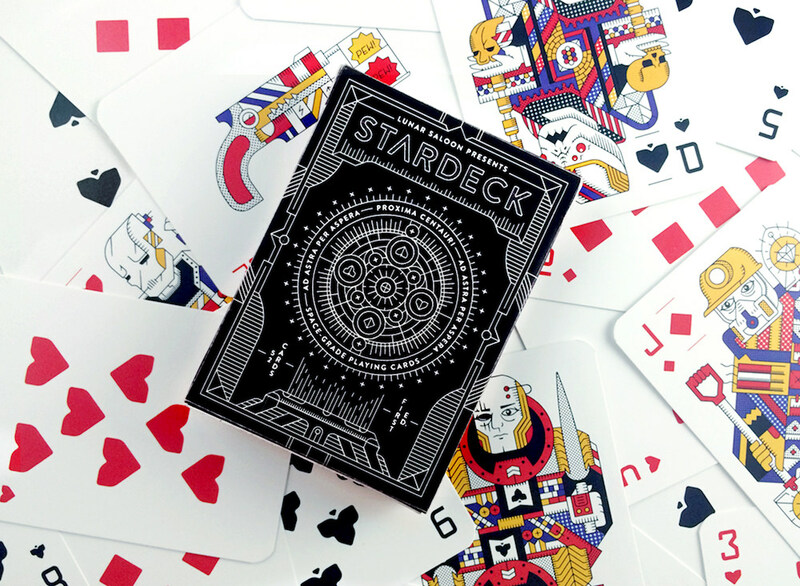 After working with clients like IGN and Game Informer, they’re currently funding STARDECK, a custom designed space-grade set of playing cards, on Kickstarter. I caught up with Alex and Meg to talk about how they got started, their influences, and dream projects. 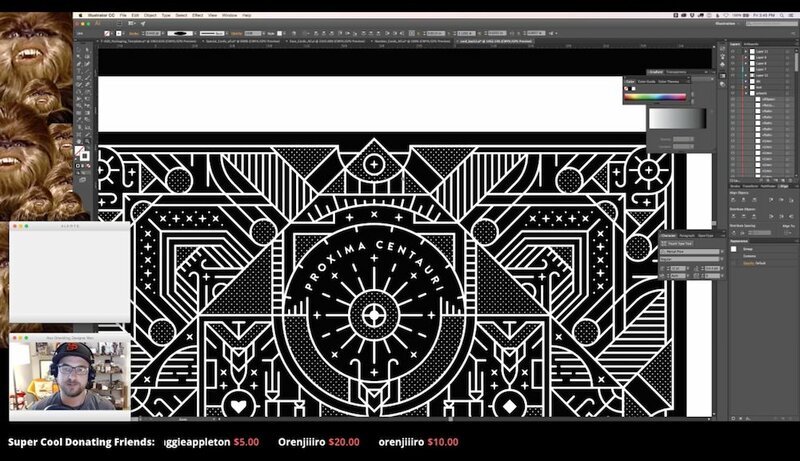 Let’s start from the beginning - where did your interest in design come from? Alex: Almost certainly from my dad. He’s been a freelance designer, artist, and sculptor in Kentucky for over 30 years. He and my mom ran the business from home, so I grew up around design and art. Over the years, they did a lot work for local businesses, but also worked with transnational companies like Coca-Cola and KFC. In recent years, my dad’s focused more on sculpture, creating work for the Hardin County Veteran’s Tribute and a Veteran’s Memorial near Ft. Knox. So, yeah. I think I was always doomed to the life of a small business owner. What kind of design education did you pursue? How would you say that’s influenced your work? Alex: I got a BFA from Murray State University, a public university in Kentucky. I couldn’t technically major in design, so I got an emphasis - which essentially means I took two more design courses than printmaking courses. I think what’s most influenced me wasn’t my focus on design, but taking design classes in tandem with sculpture, woodworking, painting, and other fine art courses. Working in all these other mediums taught me a lot about color, line work, and spacial thinking I might not have learned had I only focused on design. I’m always a little jealous when I meet designers who had the opportunity to take multiple typography courses (I had one), but at the end of the day, I’m super thankful I was exposed to so much art and art history in college. How did you decide as a couple to open up Lunar Saloon? Meg: It’s really been an organic process. I started working with Alex on the business back in 2013, as a bit of an invisible person - following up with clients, handling the administrative work, copywriting, and editing. But late last year, we seemed to hit a plateau. As a one-man-band, there’s only so much work you can take on and it limits the size of projects you can handle. We started discussing how we could see growth - partnering with other freelancers, developing products - and from that, Lunar Saloon was born. It took a bit of persuasion, but Alex convinced me to come out of the shadows and officially become a partner in the business. Throughout the winter, we worked on developing our identity and jumping through the hoops of moving from a sole proprietorship to an LLC. Now it’s just a matter of getting our name out there and expanding our repertoire, through new client partnerships and fun, creative products. As the more business-minded person on the team, what does your typical day look like? Are you approaching potential clients, or are they coming to you with projects in mind? On top of Lunar Saloon, I’m also a full time student at the University of Minnesota and working part-time in managerial accounting. Every day is a marathon, but it’s both challenging and rewarding. We’ve been very fortunate in that most of our work comes to us via word-of-mouth, so most of the time clients approach us. Though, we’ve recently begun transitioning to seek out clients that might be a good fit, just so we can take a more active role in shaping the breadth of work in our portfolio. Speaking of, where’d the name Lunar Saloon come from? Meg: Naming things has always been something I’ve loved to do. From STARDECK to Comic Relay, it’s the perfect mix of analytical research and creativity. When Alex went out on his own for the first time in 2010, we ran through a bunch of names before he settled on Alex Likes Design. Though it was glossed over at the time, Lunar Saloon was on that list and, like my gym locker combination (5-12-2), it stayed in the back of my mind for years. Alex and I both grew up with a healthy amount of sci-fi and adventure influences. We love storytelling and inventing new worlds and characters - as you can see in RayGun52, Future52, and STARDECK. Creating a business around the idea that we’re somehow bar owners on the moon embodies all the playfulness and imagination that we hope comes across in the work we produce. Meg: My dad really influenced my love of sci-fi and adventure. I don’t know how many summers I spent watching Star Trek: The Original Series reruns, Twilight Zone, and westerns with him. I didn’t realize at the time how odd it was to be a 12-year-old girl obsessed with Sergio Leone films. Obviously, I was a very popular kid. Beyond that, I had a love for science, especially dinosaurs, that still continues today. In fact, it wasn’t until late high school, when I saw the realities of the job market, that I gave up my dream of becoming a paleontologist. Of course, meeting Alex, who not only accepted all my nerdiness, but fanned the flames, didn’t hurt either. I’d definitely say that, from a storytelling and general creative aspect, my biggest influences have been the Mass Effect games, Stephen King (especially the Dark Tower series), comics like Saga, X-Men and X-Force, and Walt Disney and the immersiveness of Disney parks. 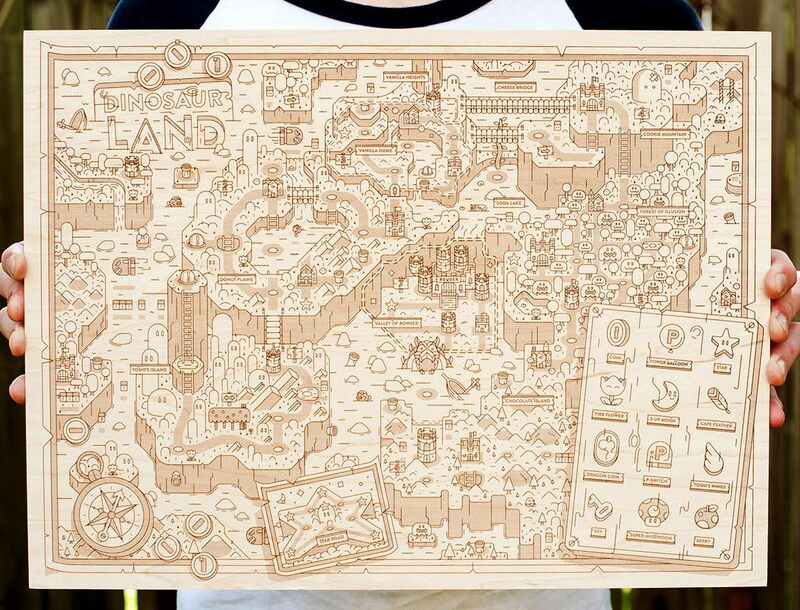 I love the idea that with Lunar Saloon, we can create products, art, and stories that can be intertwined in such a way that they create an entire fictional world for us to play in. Alex: I grew up pouring over a lot of sci-fi and adventure movies. The Rocketeer, Arnold Schwarzenegger movies, the Batman and X-Men animated series, Indiana Jones, Swamp Thing, Star Wars, and Back to the Future were big hits with me as a kid. Mom’s still convinced Heather Locklear was the only reason I loved Swamp Thing. So those definitely shaped my interests to this day. As to what’s influenced my style, I’d say Team Fortress 2, Journey (the game), Jim Lee’s 90s X-Men art, Who Framed Roger Rabbit?, and DOOM. In that, you have a soup of meticulous art direction, colorful palettes, pixel art, and the humor that shows up in a lot of the stuff I make. I wouldn’t say I necessarily look to anything for inspiration or influence, but I’m always surrounding myself with things outside of design that inevitably rub off and better my design and illustration work. What’s your process look like when starting a new project? Alex: I almost always insist on starting with paper sketches. Starting in the computer too soon leaves me to get caught up in the aesthetics of a potential direction, rather than the ideas behind them. Sketching lets me iterate much more quickly and really polish ideas into something special before moving on to Illustrator or Photoshop. Because timelines aren’t usually an issue, I’ll bend the rules a bit on personal projects, but for clients, we usually approach things with a sketch presentation, a rough vector presentation, and a more polished presentation. You’ve often streamed video of yourself as you work - where did that idea come from? How would you say it’s impacted your work to expose so much of your in-progress design and thoughts to others? Alex: For various reasons, I actually recently decided to take a step back from streaming. I still do it, but not as frequently as I once did. The decision was largely born of realizing how much time I was spending preparing for and doing the stream, relative to what I was getting back from it. It’s tough, but as a small-business owner, sometimes I have to look at things from a financial perspective and determine whether or not it’s worth my time. All that said, when I was regularly streaming, I felt like I got a lot back from the people who watched the stream. I shared a lot of my methods and approaches to problems, and sometimes that was new information to them, and other times, they had better alternatives I hadn’t considered. So it really felt like a perfect give and take with the audience, where everyone who participated came away a little better, and hopefully with a smile on their face. Illustrations for IGN at E3 2016. Photo provided by Lunar Saloon. 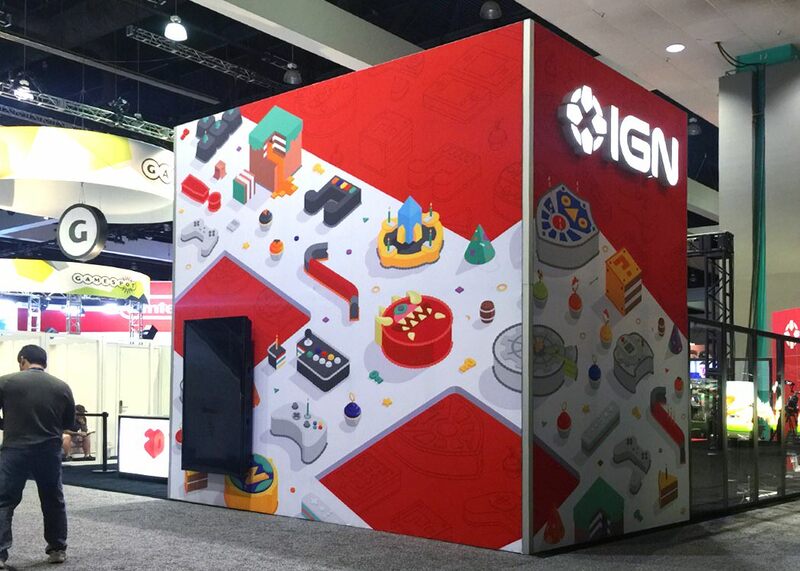 Alex: Well, every project brings along its own fun challenges and rewards, but we’re really proud of the work we made for IGN’s 2016 E3 booth. 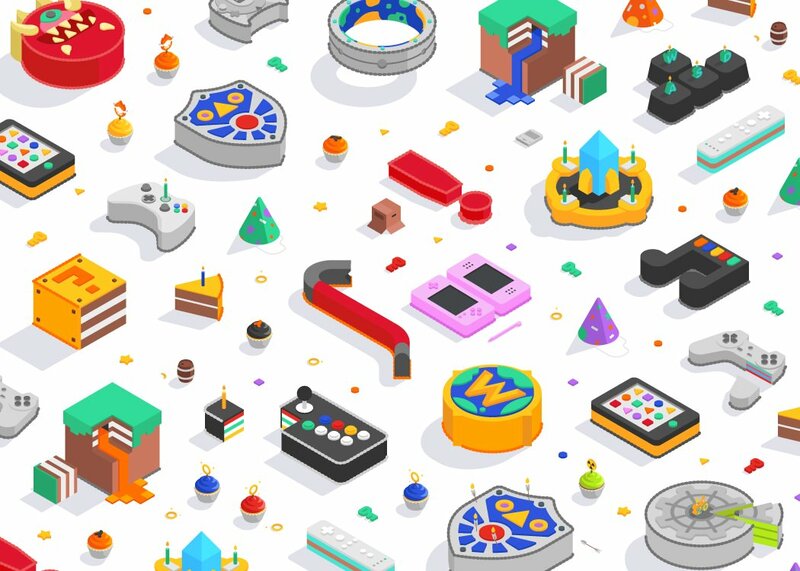 This year is IGN’s 20th anniversary and so we worked with them to develop 20 different illustrations of iconic gaming elements in the form of isometric cakes. The illustrations themselves were a lot of fun, but the most exciting aspect was seeing a 40 foot long wall adorned with the cakes. When they were all together, we jokingly referred to the illustrations as The Cakescape. Another great aspect of this project were that my primary contacts at IGN, Nicholas Macias and Justin Vachon, got approval for me to live stream the creation of the work, so a lot of the process was available for other people to see. That required a lot of trust on IGN’s part, so I am super thankful for that. So, that trust, the final illustrations, and the final application of those illustrations are why I’d rank that as my favorite project of Lunar Saloon’s. 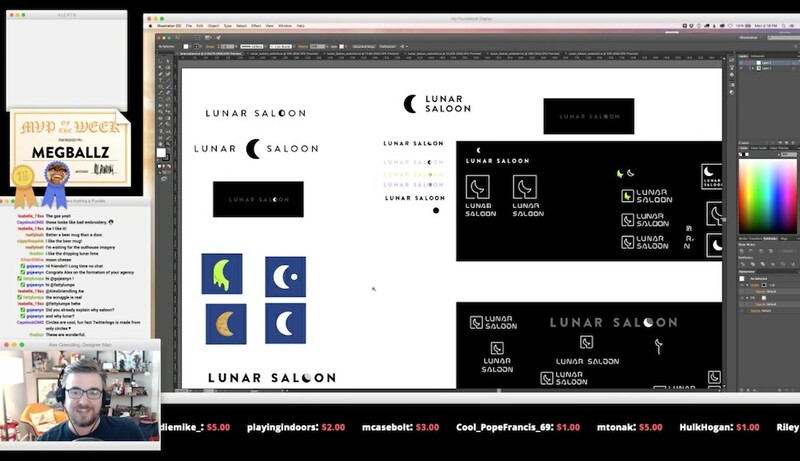 In an ideal world, what kind of project is Lunar Saloon working on a year from now? Alex: We’d love to be working with people whose business is somehow related to our namesake. Whether that’s making mission patches for SpaceX or NASA, or branding a brewery or barcade. We’re also big video game fans, and we’ve already done a lot of game-related work with clients like IGN, Double Fine, and Game Informer. We’re really looking for a shot to art direct, or design in-game assets for a game. 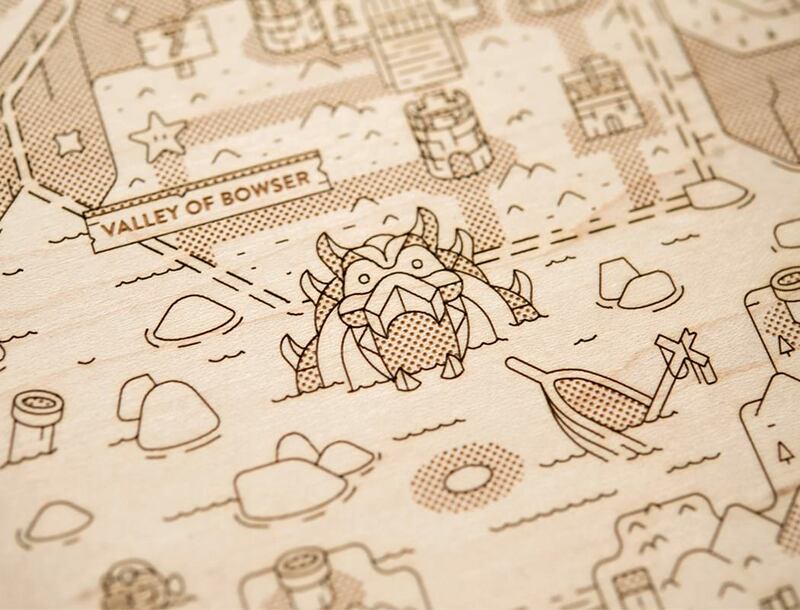 Beautiful design work in a game can go a long way toward enriching a game’s world, and we’d love to have a hand in that. So, in a perfect world, the work Lunar Saloon will be doing will occupy that nice space in the middle of a venn diagram, where our work and personal interests overlap. Alex, you’ve worked at Google, but in the time I’ve known you, you seem most at home working with a variety of clients in a freelance setting. Would you say there’s something specific that draws you toward the indie approach to business? Alex: Yes! I was very fortunate to have spent a couple years at Google, working with the Art Department. It was great spending so much time with them to help create Google’s Visual Assets Guidelines, which has been iterated on to great effect by Google’s Material Design team. What I realized about myself, or maybe more accurately what I accepted about myself, is that I’m a restless person. The big appeal of owning my own business is that I get to work with a wide variety of clients, on a range of projects. This helps me satisfy my own curiosity by learning bits and pieces of other industries, while affording me the opportunity to jump from project to project, changing things up as I go. I also like that, most of the time, I’m able to speak directly with decision-makers and project owners, which helps streamline the design process and results in better work. What’s a lesson you wish you had learned sooner? Meg: Hmm, can I just say everything? Neither Alex nor I took a single business course during undergrad (I have a degree in music, but am now studying accounting), so up until recently most of what we’ve brought to the table has come through hands-on experience. I’d say the biggest thing we’ve come to realize is the importance of having a standard operating procedure. Over the years, we’ve tried a handful of different organizational tools and eventually developed a process that can be adapted to any client or project. From the first estimate and sketching, to delivery of the final work and invoicing, there’s never a question of “now what?” This has been monumental in building confidence and efficiency. As we expand to take on multiple projects with varying timelines, we’ll be able to handle the added logistics easily. My goal has been to have all the pieces in place before we take the next step in growth, so we’re always prepared for whatever is thrown our way. Most people running successful businesses don’t take the time to teach classes, but that’s something Alex has done in the past. Why’s that such an important part of the process to you? Alex: Teaching was one of the primary motivators for starting my design stream, so when I was offered the chance to teach a class in MCAD’s (Minneapolis College of Art and Design) Post Baccalaureate program, I jumped at it. My goal as a designer is to always be the resource I wish I had when I was a student. So, that entails answering student emails, answering questions on Twitter, streaming, and now, teaching. While teaching is great in that I hopefully save other people the time it took me to learn things, it also helps me become a better designer. Learning to more clearly articulate my process and rationale to students helps me look at my own work with clearer eyes. At the end of the day, I really do ascribe to that cheesy saying that a rising tide lifts all boats, so it’s important to me to offer up what I know and get that tide rising. Swing by Lunar Saloon or follow them on Twitter and Instagram to see what Alex and Meg are brewing up next. You can back STARDECK on Kickstarter through early November - after that it’ll be available in their shop.